Country Life Carotenoid Complex - This complex contains d-salina (algae) and a vegetable medley of broccoli, pumpkin, and carrot seed, which makes this a naturally, rich source of beta-carotene and other carotenoids. 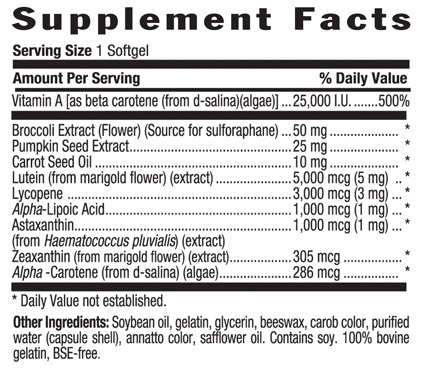 Along with lutein and lycopene, this complex also provides antioxidant support. RECOMMENDED USE: Adults take one (1) softgel daily with food. This product contains NO: yeast, corn, wheat, gluten, milk, salt, sugar, starch or preservatives. Do not take if allergic to any ingredient. ALLERGY ALERT: DO NOT CONSUME THIS PRODUCT IF YOU ARE ALLERGIC TO SOY. A: Carotenoids are found in plants and are stored in the liver where they are converted into a usable vitamin for the body's needs. Q: What does the carotenoid contain? A: Carotenoid complex contains: Lutein, Zeaxanthin, Lycopene, Alpha-carotene, Alpha-Lipoic Acid, Astaxanthin, pumpkin concentrate and carrot seed oil. Q: What does the Carotenoid support? A: Supports eye health and vision, immune health, kidney health, healthy bone development, healthy nervous system and intestinal lining.